The Rolling Stones made major strides towards composing their own music successfully during the year 1965. Out of Our Heads was released (in the U.S.) and lit the fuse for the most successful run of the band’s long career. Although about half of this album does still utilize the R&B covers on which the group cut their teeth, it is among the original tracks where the most commercial impact was made fifty years ago and where the most indelible songs persist right through the present day. The Rolling Stones were formed in London in 1962 by mult-instrumentalist Brian Jones, guitarist Keith Richards and vocalist Mick Jagger. They specialized in Chicago-style blues as well as fifties rock and roll and had a longstanding residency at the famed Crawdaddy Club. Over the following winter, bassist Bill Wyman and drummer Charlie Watts joined to round out the classic 1960s quintet. The group hired Andrew Loog Oldham, a former publicist for The Beatles, who acted as both their manager and producer for their early albums. By 1964, the group signed with Decca Records and they released their debut album, “England’s Latest Hitmakers”, during the height of Beatlemania. However, Oldham made a concerted effort to promote the Rolling Stones as the “anti-Beatles” or “the bad boys of rock n roll”. Early in 1965, the group released their second LP, The Rolling Stones No. 2 in the UK, The Rolling Stones, Now! in the US, with both versions reaching the Top 5 in their respective countries. Although the title is the same, Out of Our Heads also has two distinct versions for the US and UK. Oddly, the US version was released first, on July 30, 1965, and has become the more lauded and respected version of the album (which we’ll focus on in this review). The British version of the album contains a few distinct originals, such as “Heart of Stone”, with impressive guitars and heavily reverbed tambourine hits, and a calm, pop, version of “I’m Free”, a song made more famous by later cover versions. The US version of Out of Our Heads begins with a couple of R&B covers with pop leanings. “Mercy, Mercy” has a rotating riff and hook with slightly humorous, high pitched backing vocals. In fact, the only element which sounds like the “Stones” is Jagger’s vocals, which are as soulful and as gritty as ever. “Hitch Hike” works least well of the cover songs simply because there are many superior versions out there. This being said, the musical elements are all entertaining on this versions including the choppy rhythms and a cool guitar lead by Richards. Released as a single, early in the year, “The Last Time” was the Rolling Stones’ first original hit. This combines a perfect blend of blues and folk, while also being perhaps the furthest the Stones lean towards Beatles territory with twangy guitars and happy-go-lucky drumming by Watts. Still, Jagger’s deep, bluesy vocals make it quite distinct, especially during the frantic coda that fades the song out. Three more covers finish up the LP’s first side. Roosevelt Jamison’s “That’s How Strong My Love Is” is an attempt at deep soul, which, while not completely terrible, sounds somewhat amateurish by the Stones. Sam Cooke’s “Good Times” features a vocal range that is more suited for Jagger, while the subtle rhythms are excellent by Wyman and Watts on this track. Bo Diddley’s “I’m All Right” is a live track originally released on the EP Got Live If You Want It! The song is a short but interesting live rocker with high energy and pure sixties vibe. The album’s second side is much more original and musically substantive. This starts with the classic “(I Can’t Get No) Satisfaction”, a song which is pure classic rock personified. Led by Richards’ indelible riff, the song features, perhaps, Jagger’s finest vocal performance ever, as he performs contrasting tones between the verses and choruses. The rest of the band follows suit, with Jones performing a fast paced, strummed acoustic while Wyman plays a slightly funky bass and Watts bangs away with a fast rock drum beat, making this classic a complete band song. Released as a single month before the album, “(I Can’t Get No) Satisfaction” was the group’s first number one in the US, but was initially banned in the UK because its lyrics were considered sexually suggestive. Bert Russell’s “Cry to Me” is a bit anti climatic following “Satisfaction”, but a decent enough blues ballad nonetheless. The album then wraps up with four group originals. “The Under Assistant West Coast Promotion Man” maintains the bluesy vibe with consistent harmonica by Jones throughout and sharp drumming by Watts. “Play with Fire” has a dark folk feel and features some bass and production by Phil Spector along with old English style harpsichord by Jack Nitzsche. Recorded during a break from touring in January, 1965, this perfectly moody gem shows much of the same promise as more renowned later classics. “The Spider and the Fly” has a mosey-along, steady paced, down home groove with double guitar grooves, harmonica, and a thematically appropriate vocal melody by Jagger, having all the elements of what could’ve (and should’ve) been a hit by the band. “One More Try” closes the album as a short, boogie-woogie rocker with optimistic lyrics, making it the closest to pure sixties Brit pop by the group. 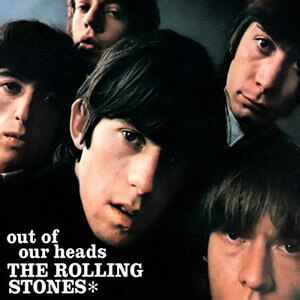 Out of Our Heads became The Rolling Stones’ first US #1 album, eventually going platinum, which the British version peaked at #2. Their following album, 1966’s Aftermath, saw the band entirely move towards original compositions and they soon found peak success worldwide. Was out of our heads the stones first album ever. I have the London album what is its value if any. Not their debut album, but the first to feature much original compositions.